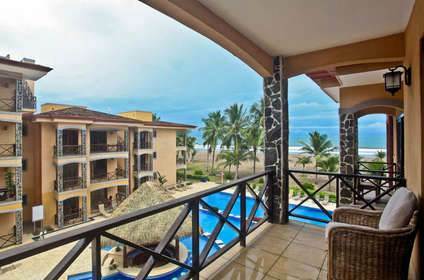 3 bedroom, 2.5 bathroom unit comes outfitted with modern designs and Costa Rican inspired artwork. Open living opens to large terrace with ocean views. Kitchen stainless steel appliances, granite counter tops and a breakfast bar, Ideal for fun filled evenings. Large master suite opens to balcony with magnificent ocean views. Located in a beautiful beachfront resort-style condominium complex perfect for group occasions and families, on one of the most beautiful beachfront estates in Jacó. It offers fantastic oceanfront and pool views from its cascading tri-level pool and direct access to the beach.